I recently read a thread about galvanic corrosion and de-lignification. It included some true facts, many opinions, a few wives tales, and a few misconceptions. I thought I'd take a crack at explaining this as I understand it, from an electrical engineer's perspective. Some of this will be old info for many of you. I am hoping to get those who may not be fully familiar with he process on the same page. 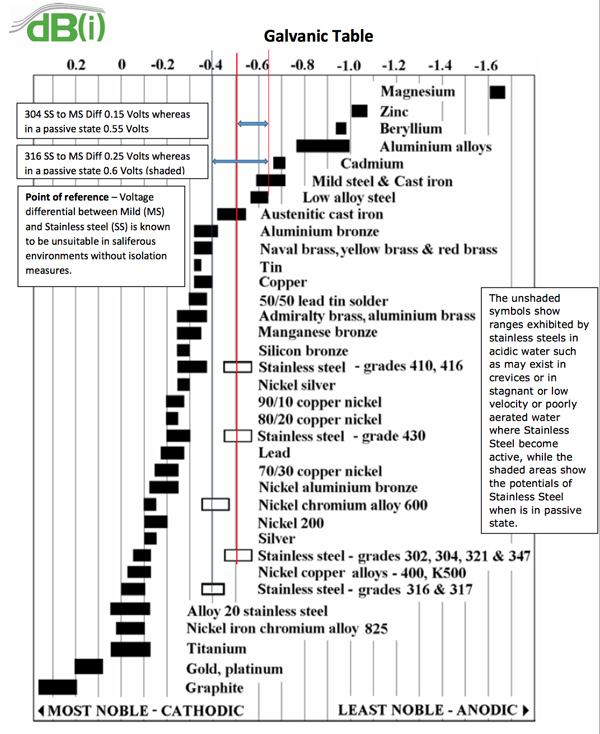 Different metals have different electrical properties. Specifically, when placed in a conductive solution (known as an "electrolyte") metals will either liberate ions, or they will attract ions. This is a result of their chemical structure and the nature of the bonds that hold the metal atoms together. Here is what is known as the "Galvanic Series". This is a ranking of metals and alloys in terms of their electropotential (i.e how electrically active they are, and in what polarity). Because of this electropotential, when two metals are in electrical contact and also immersed in an electrolyte, they will create a small battery What happens is that ions from one (the most "anodic" metal will migrate into the electrolyte, and will conduct to the other metal. This migration of ions is an electric current, except it is not electrons that are flowing. Instead it is charged atoms (atoms that are missing, one or more electrons, or have one or more extra electrons). As they leave the anodic metal, it will erode, and technically the cathodic metal (the other one), will receive a build-up of atoms on its surface. In reality, depending on the electrolyte, the atoms don't leave in a pure way, but will usually form various other compounds, We know this as "corrosion". The image on the left is important, because it represents the situation for a lot of the metal on a non-bonded boat. Wood is a fairly good insulator. Wet wood, not as much, but still not a particularly good conductor. So, screws holding wood planks on a wood frame are essentially insulated from one another. I say "essentially" because there will be SOME current flow to other metals, just not very much. Other metal components that, on a non-bonded boat, are insulated from one another include thru hulls, rudders, etc. In this image, there are only two pieces of dissimilar metals that are in good electrical contact with one another. The prop and the shaft (because they are bolted together. You can see from the Galvanic Series above, that stainless steel and bronze have almost the same electropotential, so there is very little current that will flow. To prevent the prop or the shaft from being eroded by contact with other metals (more on this below), we usually put some other more active metal in contact with them. This more active metal will more easily liberate ions into the electrolyte, and thus it will corrode before the other metals do. This is the purpose of a "zinc" (shown in yellow in the figure above). Last edited by Cogeniac; 04-13-2019 at 03:43 PM. Now is a good time! Now, you may note that I said that this was the case for a "Non-Bonded" boat. Bonding is the practice of connecting the various metal bits that contact seawater together electrically. The idea is that if they are connected electrically, they will be at the same potential, and thus will not support any current flow. From the discussion in the prior post, you can see that the exact opposite is the case. If they are connected electrically, then from a current flow perspective, they are "in contact", and ions will flow from the more active metal through the electrolyte to the less active metal, thereby creating corrosion. In general, unless the boat is made with some terrible parts, the parts that are used will be chosen so that they are not particularly electrically different (e.g. stainless and bronze, for example), so the boat, sitting on its own in the water, doesn't usually eat itself alive. Aside: Many of you may be aware of "crevice corrosion". This is a different phenomenon. All metals will corrode by themselves in the presence of the right atmosphere. Put a piece of steel on your back porch, and in a few days of damp nights, it will be covered in rust. This is oxidation, and it has nothing to do with galvanic corrosion. Stainless steel is "stainless" because it forms a transparent oxide layer when exposed to oxygen. That layer then protects the remaining steel from the oxygen, and the steel doesn't "rust". However, stainless steel DEPENDS on the presence of oxygen to form and maintain this protective layer. If it is immersed in water, there is no free oxygen, and the protective layer will not form (or will dissipate). The water will then cause the stainless to corrode. Because of the materials used in stainless steel, this corrosion doesn't happen very fast as long as the water can flow around the steel (this is why your prop shaft doesn't corrode). However, if you suppress the flow of water around the steel, hydroxide ions will remain in contact with the steel, and will erode it. Here is a bolt that was used underwater. As you can see, the part that was exposed to flowing water is fine, but the part that was inside the wood, where the water could not flow, is heavily eroded. This is because in that small space between the wood and the bolt, the hydroxide atoms could reach a high enough concentration to attack the steel. As noted above this is NOT galvanic corrosion. This is why is is not a good idea to use SS fasteners below the water line. Last edited by Cogeniac; 04-13-2019 at 03:46 PM. Well done job regarding galvanic corrosion. Now, will you tell us about bonding and stray current corrosion? There are two kinds of boaters: those who have run aground, and those who lie about it. This is great Scott! Thank you for taking the time to share it with us. Sucker for a pretty face. Getting into trouble one board at a time. So, for boats that are not bonded, and that have no other connection to any other boats, one or two strategically placed zincs will generally prevent any serious galvanic corrosion issues. If the boat is in the water, and is also connected to the marina shore power system, then it is connected electrically to any other boats that are also connected to shore power. This can cause all manner of havoc. First, you have no control over the other boats in the marina. and no control over the marina electrical system. If some guy in the next slip has a crappy ground on his boat, then his version of "ground potential" may be different than yours. Remember, when connected to shore power, the boats are connected electrically to one another through the shore power ground circuit, and also connected through the water (electrolyte). So, if there is any potential difference, current will flow, and corrosion will occur. What's worse here is that now the corrosion can be exaggerated by the fact that there is a lot of electrical power available. In this case we are no-longer reliant on the small electropotential differences between dissimilar metals, to drive the current. In stead the entire electrical grid may be driving it! As you can see each boat has a battery and, usually, a battery charger. In any boat with AC, the major conductive elements of the boat will be connected to AC ground. 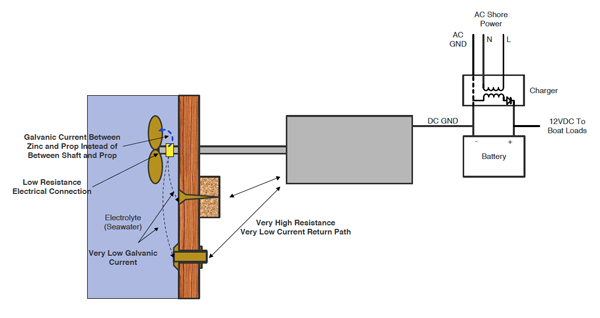 In most boats the motor, and thus the prop shaft and the prop, are also connected to DC ground, and thus through the charger, are also connected to AC ground. This is good practice, since if an AC wire were to short to some large metal part on the boat, then, without a ground connection, that part would be energized with 110 VAC (or 220VAC, depending on the marina and the boat). In that case anyone touching the metal could easily be electrocuted (for example someone falling in the water, (which would be energized), grabs the grounded dock ladder and instantly gets fried. So, grounding is important for safety when dealing with higher voltages (e.g. AC shore power voltages), and it is also necessary to assure the proper operation of large loads (try grounding your engine through a crappy little wire and watch that wire smoke when you turn the starter...). Unfortunately, all the grounding means that your boat gets connected to all of the other boats, and any other stuff in the marina that may be connected to ground. Sadly, ground is not actually "ground". All AC grounds depend on wires (at least at some point) to connect the grounded parts, and those wires can have poor connections, or even have resistance themselves. These small resistances result in a ground potential that can vary from place to place. So, for example, if you had a volt meter with really long leads that had zero resistance, you could measure voltage potential between two different ground pins on the various shore power pedestals. What's worse is that, in this situation, all those zincs are corroding and creating a higher concentration of hydroxide ions in the water. That alkaline solution then attacks the lignin in the wood, and ultimately destroys it. I show the hydroxide cloud in the figure above. 3) Install a galvanic isolator. If your old wooden boat is like mine, disconnecting it from shore power may result in finding it at the bottom of the marina. In the winter I may only go check the boat a few times, and with bilge pumps coming on a few times each day, the batteries will go dead fairly quickly. So, that isn't really a viable option. An isolation transformer is a 1 to 1 transformer that connects the AC lines from the marina magnetically to the AC lines on the boat. Because there is no ground connection, the boat is thus disconnected electrically from the marina, and the other boats in the marina. Essentially, there is no return path for any currents in the water, so they just pass your boat by. 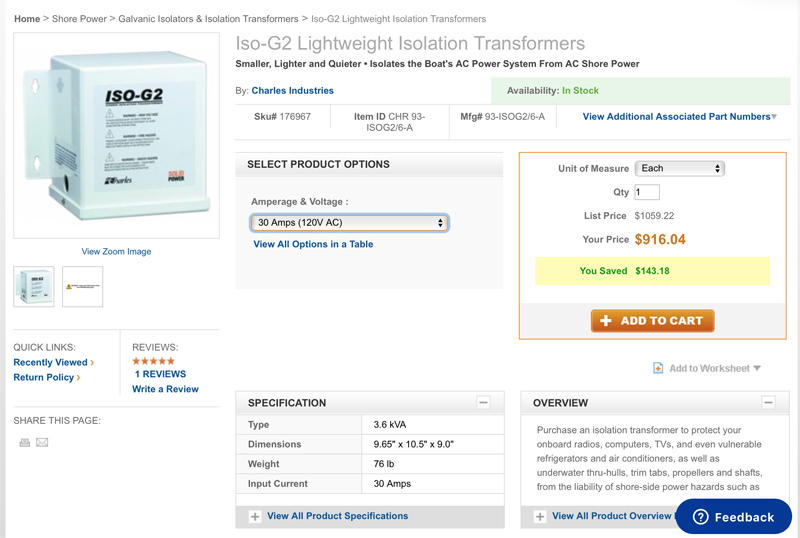 While this is a great solution, isolation transformers are expensive, large and heavy. For example, this "lightweight" 30 Amp 120 volt unit weighs 76 Lb and costs nearly $1K! The inexpensive alternative is a galvanic isolator. This is especially true for modest sized boats that are not running huge loads. The galvanic isolator is essentially two diodes connected together in parallel, in opposite polarity. Seems counter intuitive, but the idea is that the diodes will pass current in either direction. The reason they work as isolators is that all diodes exhibit a fairly fixed forward voltage drop. Diodes are like electrical check valves. They pass current in one direction, but not the other. In the "forward" bias direction current flows, but there is a small voltage drop (for silicon diodes this is 0.7 volts). 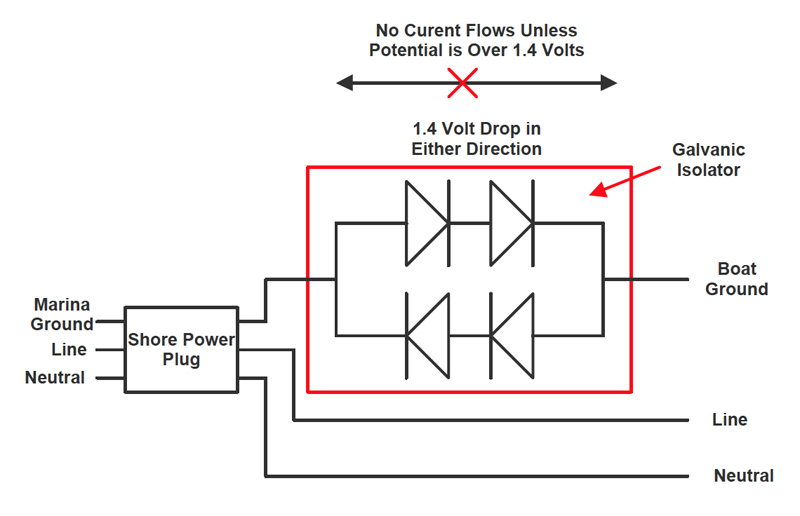 that means that if the voltage across the diode is less than 0.7 volts, it will not conduct, but it if it is greater than this forward drop, it will conduct. We saw above that most galvanic corrosion takes place at voltage drops less than 1.6 volts. If you take two diodes in series, they will have a forward voltage drop of 1.4 volts. So all you need to do is to put two of these pairs in parallel (in opposite polarity), and the drop will be 1.4 volts in either direction. This is shown below. This drop effectively isolates the ground on the boat from currents arising from potentials of less than 1.4 volts, which generally eliminates the "hot marina" issue. I hope this provides a little clarity on this complicated topic! Last edited by Cogeniac; 04-13-2019 at 03:52 PM. I apologize for being coy.And I do appreciate your post here, as well as posts and threads on this topic elsewhere on the Forum. Truly. But I do have a problem with the fact that, while some excellent information about protecting the boat and its fittings against corrosion/ erosion is provided, the part about protecting people aboard the boat from electrocution always seems to be neglected. I love boats, but I love people more. Therefore, I agree with the recommendations of the American Boat and Yacht Council, Boat US, myriad marine surveyors, most production boat builders and others, that bonding is a keystone of safety aboard a boat with an AC electrical system. Aside: Many of you may be aware of "crevice corrosion". This is a different phenomenon. All metals will corrode by themselves in the presence of the right atmosphere. Put a piece of steel on your back porch, and in a few days of damp nights, it will be covered in rust. This is oxidation, and it has nothing to do with galvanic corrosion. Stainless steel is "stainless" because it forms a trans[parent oxide layer when exposed to oxygen. That layer then protects the remaining steel from the oxygen, and the steel doesn't "rust". However, stainless steel DEPENDS on the presence of oxygen to form and maintain this protective layer. If it is immersed in water, there is no free oxygen, and the protective layer will not form (or will dissipate). The water will then cause the stainless to corrode. Because of the materials used in stainless steel, this corrosion doesn't happen very fast as long as the water can flow around the steel (this is why your prop shaft doesn't corrode). However, if you suppress the flow of water around the steel, hydroxide ions will remain in contact with the steel, and will erode it. 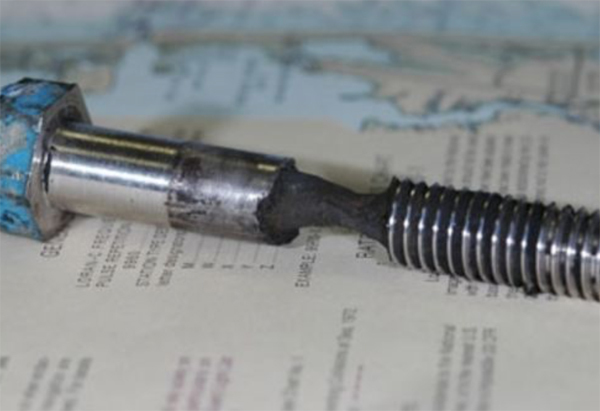 Here is a bolt that was used underwater. As you can see, the part that was exposed to flowing water is fine, but the part that was inside the wood, where the water could not flow, is heavily eroded. This is because in that small space between the wood and the bolt, the hydroxide atoms could reach a high enough concentration to attack the steel. As noted above this is NOT galvanic corrosion. This is why is is not a good idea to use SS fasteners below the water line. When the passive oxide layer on stainless steel is damaged and unable to reform due to lack of oxygen, the place where the passive film is missing is in the active condition and does act as a dissimilar metal. The bolt with the wasted area is a good illustration. Referring to a galvanic series chart, the galvanic potential of passive 316 in flowing seawater is -.05V and the potential of the active area is -0.4V, on the same piece of metal. I have inspected a ballast tank several times over a period of several years. There were some 316 stainless steel screws that were in perfect condition for years. About 3 months later they looked like the bolts in Post #3. Another problem that hasn't been mentioned directly is a differential oxidation cell. It is important to note that the galvanic potentials given in the chart were measured in flowing clean well aerated seawater. Any change in water chemistry, aeration or flow will change the potentials, and in some circumstances they can change over time. Differential oxidation cells are typically found around all nails, screws and bolts in a wooden boat. If the head is exposed to flowing water, it will have a different galvanic potential from the portion of the fastener buried in the wood where the oxygen is depleted. Plugging fasteners isn't just for looks, it helps prevent or at least minimizes this. Last edited by MN Dave; 04-13-2019 at 02:21 PM. Scott - many thanks for this detailed description. Very helpful! Interesting addition. I had missed the fact that the passive layer of SS had a different electropotential than the active layer. Very interesting. I must admit, I don't fully understand the half cell concept. Can you illuminate us?? An intelligent, intelligible and tangible contribution from your side, which isn´t suprising at all judging by your record here ! A differential electropotential on the same substrate ? Most certainly you have, a PN semiconductor junction, which may either pass current, block it or be arranged to transform incident light energy into electrical energy. In the particular case presented, with a few tenths of a volt differential, the presence of an electrolyte could lead to current passing from one side of the bolt to the other.......... ? ....I love boats, but I love people more. Therefore, I agree with the recommendations of the American Boat and Yacht Council, Boat US, myriad marine surveyors, most production boat builders and others, that bonding is a keystone of safety aboard a boat with an AC electrical system. Indeed, Kevin, guaranteeing the safety of people on board has the highest priority. An AC Isolation Transformer on board would eliminate remote ground reference (dockside potential) and it´s attendant hazards. That said, a GFCI-protected on-board AC mains panel + GFCI-protected mains sockets provided in cabin interior located away from salt spray, should provide an extra margin of safety for the on-board AC supply distribution, adding to what the Isolatiion Transformer already has provided. If need be, for those with an on-board AC gen and an Inverter AC supply (running of a battery bank), the latter could also be fed through the AC Isolation Transformer, followed by the AC Mains Panel etc.etc. for enhanced peace of mind. I could well have missed something so feel free to comment. If there is concern for a lightning strike on metallic gear (rub rail stanchions, electrical winch etc), these could be bonded together in orderly fashion and connected up to the boat´s grounding plate. Last edited by carioca1232001; 04-14-2019 at 11:20 AM. I became tired of my boat being the sacrificial anode for the whole marina back around 1990. I installed a galvanic isolator and the results were truly impressive. I can't say enough good things about it. You must be the change you wish to see in the world." Well, suppose a DC pump leaks into the bilgewater. It's going to use a submerged metal fitting to get back to ground. 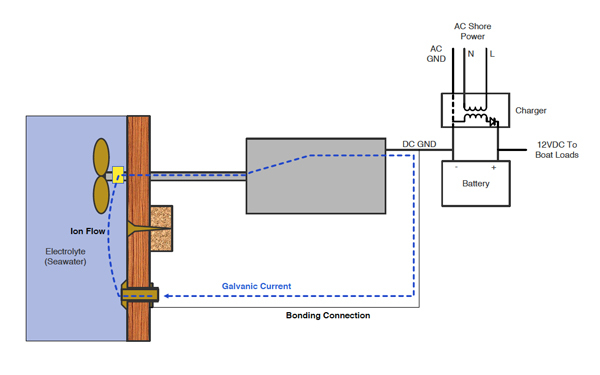 If the fitting is bonded, that stray current is directed to an anode. The anode erodes not the fitting. Now suppose an AC device shorts to its housing. With no bonding, the case is going to remain energized until a path to ground is provided-- like the owner placing one hand on the device and the other on a grounded device ( the engine) or foot in bilgewater. ThAt juice is going to travel across his chest. An Isolation transformer may mitigate this scenario (Someone care to weigh in?) but a galvanic isolator certainly will not protect people--but will help protect the boat. Underwater electrical devices offer potential for such scenarios; most times the culprit is electrical wiring which aside from being past it´s lifetime, wallows in the bilge below the waterline. Any chance of seeing '12 V DC residual current relays' in the near future to identify leaky 12 V DC circuits in boats ? Or are boaters contented with simply bonding together all metallic underwater hardware ? If said AC device is supplied via a GFCI socket (30 mA imbalance detection), the latter should trip near immediately, and the associated AC Overcurrent relay in the AC Mains Panel in close succession; the real danger posed to humans is when the fault is subtle, viz., nowhere enough to trip the AC Overcurrent relay, and there is no GFCI device associated with that branch circuit. Not true. The isolator DOES conduct in the event of a short. I, nor ABYC would approve of their use otherwise. Right. It happens sometimes. Maybe due to age. Maybe due to rough water causing wiring run high to fall low. But, also bilge pumps themselves, and certainly pump auto switches, are, by necessity, installed in water ( in many, not all, bilges). Equipment fails. Sometimes. When it does, where is the protection without bonding? The USCG and UL standard is for spark protection. Its not relevant to this discussion. To my knowledge--I'll happily stand corrected--there is no USCG standard, or other standard, for current leakage. Granted, maintaining a bonding system is tough in a wet, salty bilge. Especially when the standard is for maximum of 1 ohm resistance in the system! Water heaters, Air-conditioning, battery charger,and more are hardwired, not plugged into a receptacle, typically. New boats must, to be ABYC compliant, have ELCI ( Electric Leak Current Interrupt) circuitry installed, which will protect as you say. The boats built and maintained on this forum? Older boats? They wont. And as for GFCI, they are made with a 5 milliamp tolerance so as to minimize nuisance tripping . A 2 or 3 ma leak will not trip them but will cook a through-hull fitting, or cause cardiac arrest in a swimmer near the boat. Bob, my point is that a galvanic isolator plays no part in protecting a person who touches a piece of equipment the case of which has become energized, and also touches ground. If you maintain that it a galvanic isolator wil provide protection in that scenario, please explain how. Owners prefer to skimp and save on essentials, periodic haul-outs forever rescheduled, although great sums are spent on niceties (quality paint jobs, upholstery, galley, electronics etc). Have frequently been tempted to bond everything - playing follow the leader - but Cogeniac (Scott) provided some justification above not to......... specially now that my wiring (tinned)and electrical connectors/connections are brand-new and sheathed over with heat-shrink-glue-melt jacketing. My boat (1962) is 57 years old and the underwater discharge outlets, raw-water inlets etc. are original and in great shape. I am the second owner (spend a lot more time + funds working on it than being out on the water !). European manufacturers have developed sophisticated AC + DC residual current detection devices to protect end users, due to the proliferation on AC Inverters to power up washing machines and ancillary appliances in households. The boat market need only signal the need and manufacturers are sure to rise to the ocassion. Following my first refurb in 1997/2000, there were AC power sockets/outlets in the fore cabin, main cabin, galley and head; these never contemplated powering up Airconditioners, but were backed up with AC Blue Seas Breakers on my AC Main Panel. In my second refurb, currently underway, just two AC outlets were deemed adequate, one for the galley/fridge and the other for the battery charger housed in the helmstation. The 5 mA residual current trip spec of an AC branch circuit seems stringent, but not if one considers the conductivity of the surrounding medium (salty/brine); the 30 mA rating applies to the the residual current (cumulative rating) of the main AC Panel that oversees all AC circuits. In households, branch circuits currently trip at 30 mA residual current, markedly different. I Wrote an article (based on my experience)on a New Zealand Classic boat site some years ago. It was never meant to go world wide but of course it has. The subject boats I wrote about, do not have shore power and in most cases not on a marina. The common factor is they are bonded and have zinc anodes and show serious serious alkaline damage around the stern and rudder tube area. My advice has been to use proper marine metals underwater and do not bond or use anodes on a wooden boat. As a boat builders apprentice in the 1960's we were taught. Never use dissimilar electrically connected metals underwater and never use Brass. We never saw the alkaline wood damage we see today as the boats had copper and bronze fastening and bronze shafts, no one used anodes. The modern way is to use Manganese bronze (Brass) and protect it with an anode. What metal could be more dissimilar than bronze and Zinc. I wrote what I thought and people listened. I thought I had better check that I am right. I did some experiments with a battery and very soon had a bucket with the by-product Sodium Hydroxide in the bottom. As you know Caustic Soda softens wood and is a paint remover. The mystery to me is. Electrolysis of water requires 1.29 volts. I have checked and you can see Hydrogen bubbles over that voltage. So I ask my self exactly what is happening with less than one volt. I currently have an experiment underway. A clear plastic bottle of sea water with a piece of manganese bronze protected by a small anode. After about 4 months I am getting what I believe is sodium hydroxide around the Cathode and in the bottle. I have checked the ph of the water and it the same as fresh sea water. So the result is much as I expected. Exactly what is happening on bonded boats with Anodes. The Sodium Hydroxide forms round the Cathode and trapped in the stagnant water surrounded by wet wood. Just as is happening in the bottle. I am a semi retired Boat Builder I do not have a degree in Wood Chemistry. I have researched the subject. 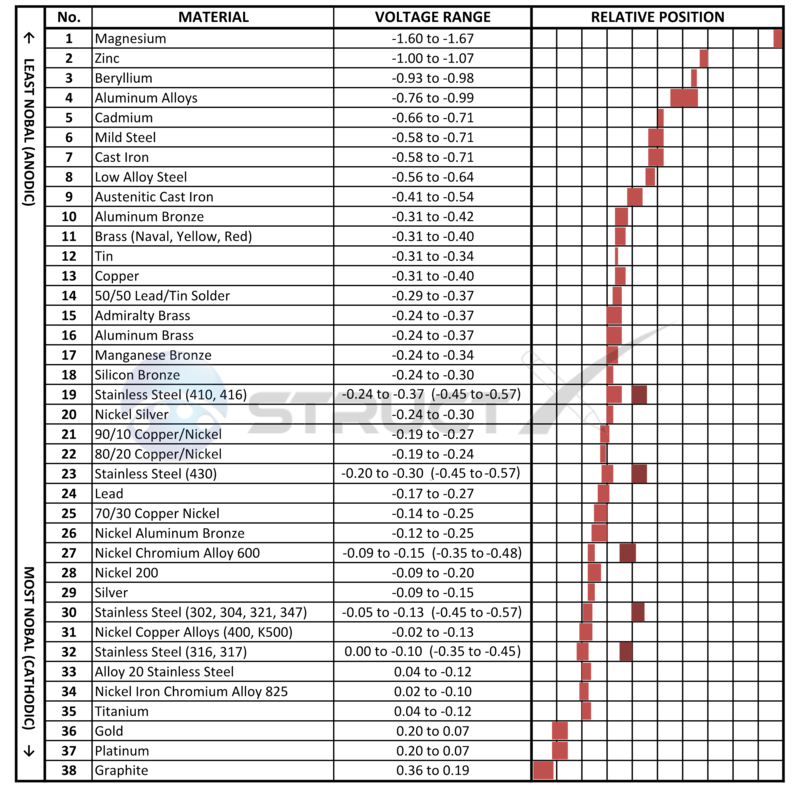 There is technical information available but obscure and overpowered by the Anode promoters . I list the references in my original article on www.waitamata woodys.com under "Electrochemical damage to wood"
Feel free to challenge what I say. But please remember, my interest is saving the wood. Metal can be replaced. Sorry this is much abbreviated but the detail all been written before on this site. Last edited by Chris mcm; 04-15-2019 at 06:55 AM.